Taking Back the Streets ! 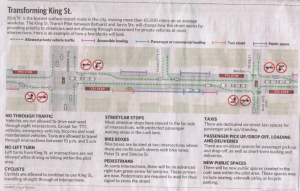 3 big Blocks of King street west, go pedestrian friendly ! – Accurate (Peel) Appraisals Inc. Taking Back the Streets ! 3 big Blocks of King street west, go pedestrian friendly ! Yes, It has happened! Toronto takes another small step but a metaphorically another giant leap into making Toronto a World Class City. Factually, it is just as quick to walk from Liberty Village to Yonge Street as it is to ride the Red Rocket. This is a very sad testimony, especially if Toronto truly aspires to becoming a World Class City. 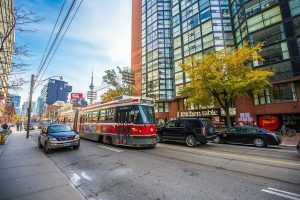 Presently, a new progressive pilot project is being proposed that would give Priority to Streetcars, Pedestrians & Cyclists over private vehicles. The 3% majority has been officially vanquished. Sincere Congrats to all the City Council members for re soundly voting 36 to 6 for the Bloor Street cycle lanes. We are now being better served! The Provincial Grinch that stole our Christmas housing Cheer!